I love pink. 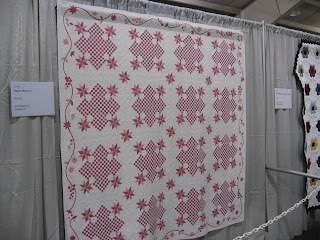 And this quilt aptly named Pepto Bismol took Second Place in the Pieced Traditional Class at QHC over a week ago. 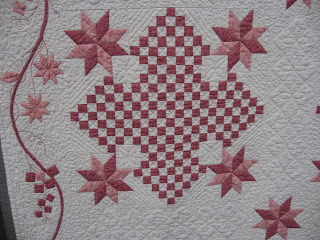 The quilt was made by Anna Macaluso of Totowa, NJ. I'd be tickled pink to sleep under this beautiful quilt. And...as a sidebar, Pepto Bismol was made up in Norwich, NY where I go to Chenango Piecemakers Guild. Back in the early 70s the Chemical Workers Union up there went on strike for better wages. As secretary and later president of the Chemical Workers Union at Lander Company in Binghamton I got to know some of the workers up there. Rumor has it that some of the top dogs were having a problem making Pepto Bismol and couldn't get the color right. One day it was green. Today SweetOldBob brought in a nice thick envelope for me from Peg Ross who is the Town of Greene Historian. There were pictures of some of my Johnson family and a Johnson house, now gone. This family lived in the Town of Greene in the Page Brook and Johnson Corners area. We had Easter dinner with my daughter, son in law and grandson. My son, brother and a nephew joined us. I tried a new recipe for lemon squares. They were nice and tart and delicious. The recipe called for 3/4 cup of lemon juice (3 1/2 lemons) and zest of two lemons. Next time I will put parchment paper in the pan first to make getting squares out much easier. And another piece of good news. My ring that Bob gave me for Christmas 2007 was finally retrieved from the recliner. It fell out of my hand one night and went down the side of the chair. After all the tipping upside down, I finally felt it on the front of the chair arm. We were able to push it down and pull some staples from the bottom and slide the ring back out. It went back on my finger. More good news. Cousin Ella Mae had her second hip replacement surgery last Tuesday and came home Friday. She's doing quite well. She had a call from our friend June Lee today. June is visiting a son in Tennessee. Her daughter Michelle surprised her with a visit.